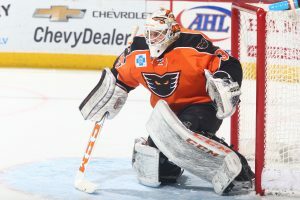 Lehigh Valley, Pa. – The Lehigh Valley Phantoms tallied a pair of shorthanded goals Saturday evening and Dustin Tokarski turned in a 33-save shutout in earning a critical 3-0 victory over the Providence Bruins in front of 8,015 fans inside PPL Center. With the win, the Phantoms improved to 41-16-3-5 overall this season as Lehigh Valley continues to lead the Atlantic Division in both wins (41) and standings points (90). In fact, with Saturday’s triumph, the Phantoms became just the AHL’s second team to reach the 90-point mark this season. With Saturday’s victory, Lehigh Valley trimmed its magic number to clinch a berth in the 2018 Calder Cup Playoffs down to just seven standings points. Saturday’s contest continued the Phantoms’ stellar of late as Lehigh Valley captured its 14th victory over the team’s last 18 games (14-2-2). What’s more, the Phantoms have now earned standings points in 14 of the club’s last 15 games at PPL Center (12-1-2) as Lehigh Valley improved to 22-6-5 at home this year. Phil Varone (20th) and Radel Fazleev (3rd) both scored shorthanded while Steven Swavely (3rd) rounded out the offense for the Phantoms in front of Tokarski who captured his 17th win and fourth shutout of the season. The 28-year-old netminder has been stout between the pipes in recent weeks as he’s produced a 5-2-1 mark across his last eight starts to go along with three shutouts, a 1.55 goals-against average and 0.951 save percentage. Tokarski is now 17-7-5 overall this year. Varone’s goal continued his impressive season as he increased his league-leading point total to 63 points (20 goals, 43 assists). The 27-year-old center has already established new career highs in both goals and total points and has now recorded at least one point in 42 of 64 games this season. 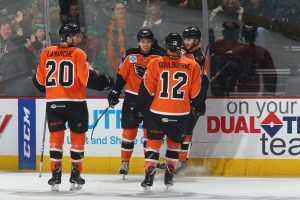 Saturday’s game marked the first time this season the Phantoms have scored two shorthanded goals in a single game as Lehigh Valley has now converted 10 shorthanded markers this year. Lehigh Valley’s penalty kill was a perfect five-for-five in Saturday’s win as the Phantoms have now allowed just four power play goals against across the team’s last 12 outings (37-for-41). Saturday’s game was just the second of six total meetings this season between the Phantoms and Bruins but did kick off a stretch of five head-to-head collisions between the Atlantic Division foes over the next 23 days. In fact, Lehigh Valley will face off against Providence four times over the team’s next nine games. The Phantoms are now 2-0 against the Bruins this season. Neither side found the back of the net in the opening period despite a combined 26 shots on goal. Tokarski answered each of Providence’s 16 first period offerings while Bruins’ goaltender Jordan Binnington turned away all of Lehigh Valley’s 11 shots on goal in the opening frame. The Phantoms broke the scoreless deadlock just past the midway point of the second period when, despite skating shorthanded, Tyrell Goulbourne was able to slip a pass into the slot for Fazleev who snapped home a perfect wrist shot into the upper left-hand corner of the Providence goal for his third goal of the season. Goulbourne collected the only assist on the shorthanded conversion netted 11:36 into the middle stanza as Lehigh Valley improved to 26-3-5 when scoring first this season. 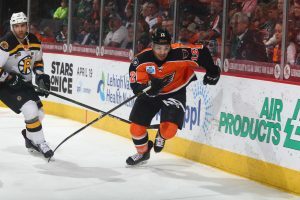 Lehigh Valley then doubled its advantage just under seven minutes later when the Phantoms converted yet another shorthanded marker. With Mikhail Vorobyev in the penalty box for interference, Varone forced a neutral zone takeaway before driving down the right wing and sending home his 20th goal of the year. The unassisted tally came 18:34 into the second period and marked the first time this year Lehigh Valley has netted a pair of shorthanded tallies in the same game. The Phantoms landed the game’s final strike with just over five minutes left in regulation when a Colin McDonald shot from the right wing produced a rebound atop the goal crease that was promptly punched in by Swavely for his third goal of the season. Phil Myers garnered the secondary assist on the even-strength strike buried 14:50 into the third period. The Phantoms cap this week’s action on Sunday when the team welcomes the Springfield Thunderbirds to PPL Center for a 3:05 p.m. showdown. Sunday’s game features a Phantoms Wall Cling Giveaway to kids 14 and under presented by PSECU. A limited number of tickets remain for Sunday’s game and are available HERE. Family 3-Packs are available for select games in March including three tickets, three hot dogs and three sodas with souvenir cups. The package is available for $67.50 and fans can add extra tickets to their group for $22.50 each. The Family 3-Packs are valid for games on March 18th, March 30th and April 13th. Secure your Family 3-Pack by calling the Lehigh Valley Phantoms at (610) 224-GOAL .